Far More Than Rubies: 20 Weeks! How far along? 20 weeks! I can't believe we are halfway through this pregnancy! The last month has gone by amazingly fast and I imagine that December and January will go by quickly as well. Total weight gain: At my 17 weeks appointment, I was back to my starting weight (I had lost five pounds during the first trimester, and had "gained," it back by 17 weeks, without gaining any additional weight.) I'm really happy with that and am really conscious about gaining healthy pregnancy weight. Baby Bump? YES! Just within the last week, really. Which surprised me, because I thought I would start to show closer to 16 weeks. I started getting anxious to "see," the pregnancy at 18 weeks, and I'm so glad I am showing now! We were shopping in a mall last week, and I was wearing a normal shirt, instead of my long and loose conservative shirts. Every time I walked by a window, I'd go "Wow! Look, I'm pregnant!" It was a pretty exciting moment! Maternity clothes? Bella Band with my unbuttoned pants and one pair of maternity jeans. Mainly my maternity jeans. I'm going to need to get a few more pairs of pants soon, though. I love the fact that I wear loose and long shirts anyways! Cravings: Hmm, not much, I suppose. I had a dream about Cheetos, then my friend had them at school today, so I begged Ian to find them when he ran errands today. Does that count? Symptoms: Fatigue, some mild abdominal cramping, and hunger! Sleep: I've had a few bad nights, but other than that, it's going really well. I've gotten used to sleeping on my side and am dozing off faster than last month. Best moment this week: Finally "popping!" I'm so glad I look pregnant now. Movement: I'm still not really sure. I've had some weird pains but nothing definite yet. I'm going to be asking my doctor about it next week if I still haven't felt anything. I don't think it's anything, but I know that by 22 weeks most women have felt something definite. Gender: Still clueless. We find out next week, on December 1st! I'm really excited and have no guess over whether it is a boy or a girl. We're excited to start shopping and talking about names, which we've avoided so far so that we don't "waste time," on picking out both. Belly Button in or out? Still in. Though it seems a little off center to me. Strange. What I miss: Having dinner fill me up. I eat and within an hour and a half I'm hungry again. Late night sncaking on apples, oranges, and milk have become the norm. Weekly Wisdom: Drink your water! To keep swelling down, drink, drink, drink! Milestones: "Popping," sleeping better, hitting the half way point. So close to finding out the gender! You look fantastic Brittney! So excited for you and can't wait to see your bump get bigger!!!!! You look great! Can't wait to hear whether it's baby boy or baby girl! You look great! I can't wait to hear the gender - I've been torn this entire time about what I think you're having. I have opinions about everyone's baby's gender, but not yours - I keep going back and forth. Ha! 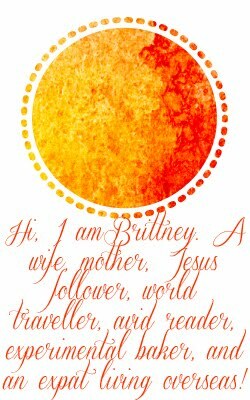 Brittany, I have been away from blogger and am SO happy for you!! YAYY!! Congrats on the pregnancy. You look fabulous. So happy for you and your hubby! :) Blessings! yay for being half way!! :D And yay for "popping" as you said! I'm sure you'll be feeling that little blessing move any day now! SOO SOOO SWEET! :) I love this! What a beautiful mommy-to-be!